The game of hockey has a long tradition in the Miller family. For Michigan native and Detroit Red Wings forward Drew Miller, learning the family trait meant continuing a rich tradition at Michigan State, long car rides in the family van, and listening from his wise older brother, Buffalo Sabres goalie Ryan Miller. After winning the Stanley Cup in his first year as a pro, Miller has grown to become an asset with his current team, Detroit, in a city he feels has a lot more to give both on and off the ice. Kathryn Tappen: Big game coming up for you! The stage is set for New Year's Day at Michigan Stadium in Ann Arbor for the [2014 Bridgestone NHL] Winter Classic. How much are you looking forward to that game? 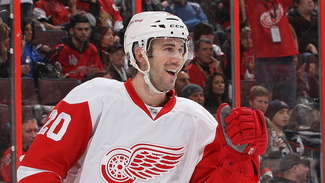 Drew Miller: It's going to be an exciting game. To think that over 100,000 fans will be watching is completely overwhelming to even think about. We skated at Comerica Park last week for practice and it's a bit different skating outside. The rink seems so small, to think that the football stadium is way bigger than that is going to be quite an adjustment. The game itself will be such an incredible experience to be a part of. Seeing that it's Michigan, that will be an adjustment for me as a Michigan State guy. That's foreign territory for me. Me and [Red Wings teammate Justin] Abdelkader haven't quite figured out what we're going to do yet. We may have to wear something Michigan State underneath our gear for morning skate. KT: How many tickets did you have to get for friends and family? DM: I got 15 for my wife's family and my immediate family, but we have about 30-40 people who will be coming, so it will be a lot. KT: Did you get any advice from your brother Ryan on what to expect playing outdoors? He played in the inaugural Winter Classic in 2008. DM: I am sure before the game we will talk and I'll listen to what he has to say. The biggest thing he has said is that it's a great experience and something that I will remember forever. He said it's nothing like any other game you'll ever play, since you're outside and in the cold, and the atmosphere is incredible. You have to try and play it like any other regular-season game. KT: Your family moved around a lot when you were growing up in order to be involved in elite youth hockey. Tell me about how that affected you? DM: My parents definitely put the time in for us to commit the time for us to play. I lived in East Lansing [Michigan] a couple of different times; we lived towards Detroit at one point. I actually played for Honeybaked in Detroit for almost seven years, and we commuted from East Lansing an hour to practices and games four days a week. KT: I hear your Mom was one of the first to have a VCR in her van for the long rides. DM: (laughs). Yep! We had a couple of other kids who would come with us. One of them, Corey Potter, who plays in Edmonton, his parents became my second parents because we shared rides down to Detroit for about six years. KT: Are you still very close to Corey? DM: Oh yeah, we see him in the summer. We usually work out and train together in the offseason. Our wives are friends and we still are very close friends. KT: You have a very large family, two brothers and a sister. I'll get to Ryan in a minute. But I hear your brother Bryce is an Eagle Scout. DM: My younger brother never played hockey past mini mites. He's a computer graphic design guy now. Very smart. He's the brains of the family. He took the road less traveled for the family. There were times in high school he would just go and teach himself Japanese. He definitely had the brains, it's quite impressive. KT: Your brother Ryan is no stranger to hockey fans. Now that you're in the same conference, how is it playing against one another? DM: The first time I played against him I was very nervous. I had mixed emotions. I didn't want my team to blow him out, because you don't want to see your brother lose like that. But at the same time you want to win. Now I just go out there and play. KT: It's probably harder on Mom and Dad than the two of you when you play against each other? DM: It's very fun for family and friends to watch it. For me and Ryan it's a lot, trying to get tickets and dinners planned. My mom is very good at sewing so she made her own jacket, half Detroit and half Buffalo. She put our numbers on it. She tries to stay pretty neutral. My dad always roots for whomever needs the win more or he wants it to be close. He tends to be politically correct when it comes to the game. They both want Ryan and I to just play well. KT: Then there's your sister Brynn, who I'm sure has a hard time bringing anyone home with three older brothers, two pro hockey players and an Eagle Scout. DM: She's got three brothers who look after her. We definitely want to be supportive of her personal life, but try not to make it too hard on guys. But we want to make sure she's with someone who treats her well. She's still in college at Michigan State, living the college life. KT: There is a rich history and quite the legacy at Michigan State for the Miller family. DM: It's a family tradition to go there. My grandfather went there early 1950, and was the first in our family to play hockey there. I was the 10th. It's an honor for our family to be Spartans. All my siblings went there and my dad played hockey there as well. We grew up right near campus and attended many Michigan State hockey games. I idolized Michigan State players almost more than NHL players just because I saw them in person by going to the games. I wanted to be a part of the tradition even as a young kid. KT: Your cousins Kip, Kelly and Kevin were Spartans and later went pro as well. Were they role models to you? DM: I got to watch them growing up playing at Michigan State, and knowing that they played there in college and later had careers in the NHL put it in my mind to try and follow the same path. I got to watch them in the summer training. They used to bring me to the rink and I became quite a rink rat. I filled water bottles for them. I think that's where I developed the passion and love of the game, seeing them work hard and have fun. That's where I saw the future of what I wanted out of hockey. KT: Your career in the NHL began with a Stanley Cup in Anaheim. Not too bad! Tell me what that year was like for you. DM: It was my first year pro so I spent most of the year in the minors in Portland. They called me up for the [Stanley Cup] Playoffs and I played Game 5, the clinching game in the first round against Minnesota. I didn't play the next two rounds. Then Chris Kunitz broke his hand the last game of the [Western] Conference Final, so they put me in with Andy McDonald and Teemu Selanne -- and what a line! It was Game 2 and a bit overwhelming for me. To think that I was playing with those two guys in the Stanley Cup Final was surreal. I played well, and I think the best part of the experience for me was to be around the locker room with a team who ultimately wins the Stanley Cup. In that locker room was Selanne, Rob and Scott Niedermayer, Chris Pronger, [Ryan] Getzlaf, [Corey] Perry, the list goes on. I learned lessons throughout the whole playoffs that made me the player I am today. KT: Do you pinch yourself and think that you won the Cup in your first season with that group? DM: Yeah, definitely. I was in the right place at the right time to be a part of it. Players play their whole careers to win a Cup, and I was definitely fortunate and honored to be a part of it. At the same time, it would be nice to win it again and be on a team for the whole season, rather than being called up from the minors. That's the mindset I have, which is why I would like to win it again in my career. KT: Detroit unfortunately has experienced economic ruin, and the city is in trouble. But I would imagine you see things differently as a player in Detroit. Describe what it's like to play for the Red Wings. DM: We have some of the best fans in the entire League. From the outside looking in, the city of Detroit is hurting. But when you're downtown and you feel the vibe from baseball, football and Joe Louis [Arena], and it's really building back up. It's busy, people are around and about. You feel like it's on the upswing right now. I think there are only good things to come after you hit rock bottom. I wouldn't be surprised to see Detroit bounce back real soon. KT: You created the Spartan Buddy program at MSU. Tell me about that program and why you enjoy charitable work so much. DM: The Spartan Buddy program was something I am very proud of as I was given the opportunity to start it. So many different sports, not just hockey, but all different men's and women's sports at Michigan State would sign up and go on hospital visits. We visited the kids in hospitals on a weekly basis. It's not quite as big now as it was when we were in school, but there are still groups that are a part of the program. The same goes for me here in Detroit. We are always involved in the community as much as we can with our schedules. It's so easy for us to go in to these hospitals and brighten up the children's day, try to get their minds off what they're going through. I love visiting the kids because that can make a big difference for them.